Tom McIntosh, of Maple Ridge, British Columbia, is enjoying his retirement on three acres of land where he cares for his garden and raises Labrador retrievers. He bought his first Gorilla Carts® Cart a year ago and another one just three months back. “We burn wood in the winter and have the wood and trimmings to haul about. A Gorilla Cart holds about the same as three wheelbarrows,” he explains. Tom got a little creative with one of his Gorilla Carts, welding together a frame to attach to the Cart so he can haul logs longer than four feet. We give you an A+ for craftiness Tom! Jerry Boles recently took a trip to Justice Orchards in Hendersonville, North Carolina, one of the many apple orchards in the area. The orchard had a fleet of over twenty Gorilla Carts Carts for visitors to place the apples in. “After then, I had to buy me a Gorilla Cart. I knew if it is good enough for the orchard, it is good enough for me,” says Jerry. 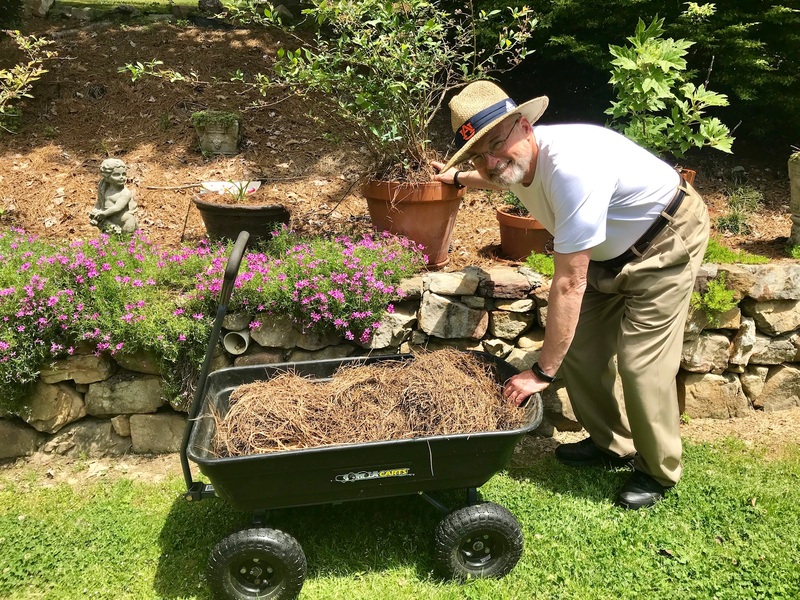 He uses the cart to load and haul pine straw that he places around his thirty blueberry plants. “About the first week in June we will be busy picking blueberries,” he adds. Well, Jerry, we’re hoping for an invite to help you pick (and eat) those berries! Lila Bender is a retired homeowner from Vancouver, Washington. She enjoys gardening and spending time with her grandchildren, who love to help her around the yard. Lila bought her first ever Gorilla Carts Cart at Home Depot this past February. With a greenhouse on her property and several raised garden boxes, there’s always plenty of yard work to be done. “I’m always planting new things and have lots to maintain!” she says. To protect her back, she tries to refrain from lifting heavy items. Lila reports, “I moved some big flower pots around the house this week and used the dump feature to set them down so I didn’t have to pick them up again! Love my cart!” Way to go, Lila; keep enjoying your Gorilla Carts Cart!